The operation of the Management Authority was financed by the European Union until the end of 2015. From 2006 to 2010 the operation of the Management Authority was mainly financed by the Environment Operational Programme. The majority of the personnel was hired, basic equipment was acquired and two studies were completed on the population and the ethology of wild horses in the Axios Delta, as well as on the cormorant’s diet and its effect on fish catches, all within the framework of this program. From 2010 until the end of 2015, its operation was financed by the 2007-2013 Macedonia-Thrace Operational Programme (NSRF). Under this framework, the Authority was able to continue its operation, its scientific personnel was reinforced, additional equipment was acquired and more studies were realized, such as the Management Plan for the National Park of the Axios Delta and the study for the Environmental Flow Requirements of the National Park. Important projects were concluded at the same time, such as the renovation of the Information Centre and the creation of a new office building, the creation and placement of exhibits in the Axios Delta Information Centre, the signposting and delimitation of the National Park, as well as the upgrading and cleaning of selected points across the 1st zone of the National Park at the Delta Municipality. At the same time, the Management Body utilized financing instruments such as the INTERREG cross-border collaboration programme (AXIOS ECOTOUR and IT PROTECTED), the Operational Programme for Education and Initial Professional Training (EPEAK), while it also participated in an EEA programme. The Management Authority is also supported by the Green Fund, for needs which cannot be covered by the European funding programmes, while its budget also benefits from income from the operation of the hydroelectric plant at Eleousa, through the Operator of the Electricity Market (LAGIE). For 2016, the operation of the Management Authority is financed by the Greek state Green Fund. Several herds of wild horses live in the meadows and islets of the Axios Delta? They are the descendants of the horses that farmers abandoned in the area in the 1960’s, when tractors and machinery took their place in agricultural production. 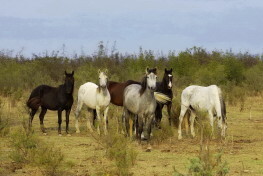 The horses found in the Delta a suitable place to live. They survived, thrived and bred, and learned how to live together with the rest of the wild animals and the cattle that live in the area. So, today, they are an integral part of the Delta ecosystem.